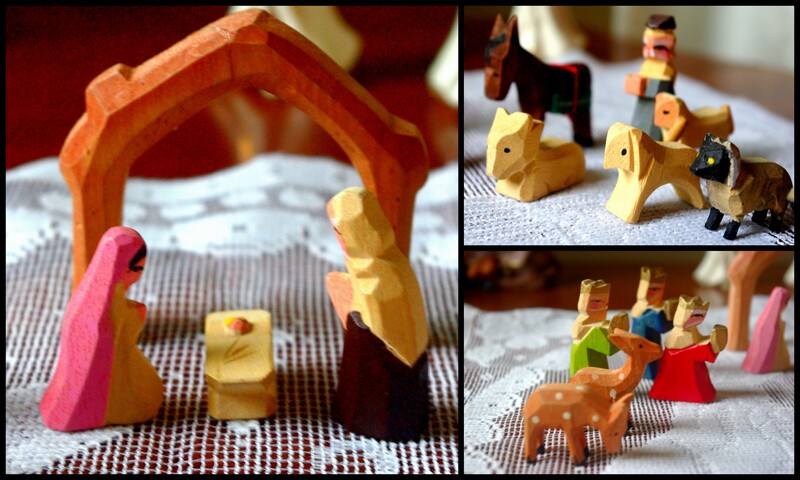 Wooden Nativity | The Happy Wonderer ~ ellen b.
PM1910. This postcard is from a stash I have that Dear’s Great Great Aunt Emma Danielson collected. Many who knew her would send her postcards over the years. This one was postmarked 1910 with a 1 cent stamp on it. 1. 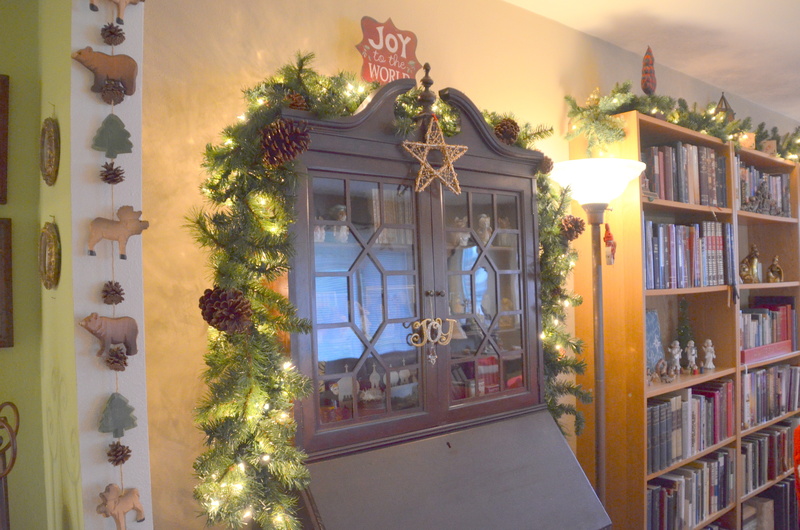 Let’s talk holiday decorating. On a scale of 1-10 where do you fall? 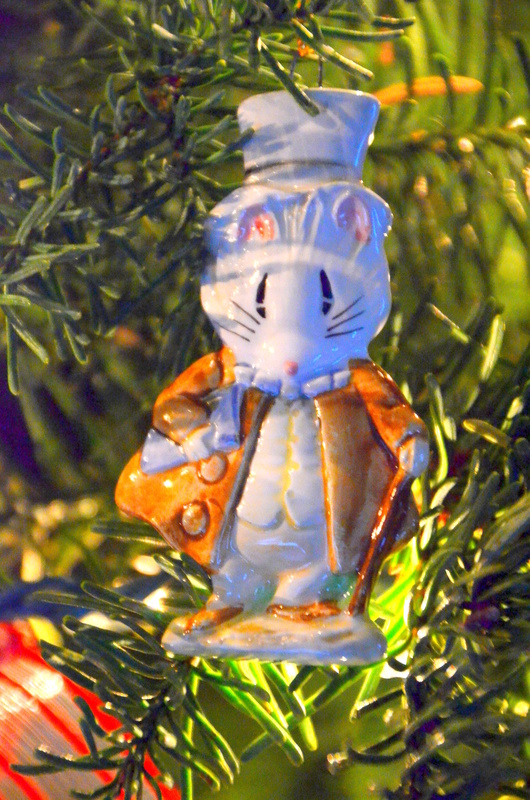 (1=Scrooge and 10= Clark Griswold). What’s your favorite corner-room-table-space to decorate? Is it done? My best guess is that I’m about a 6 since I only decorate 2 rooms and a small area outside. 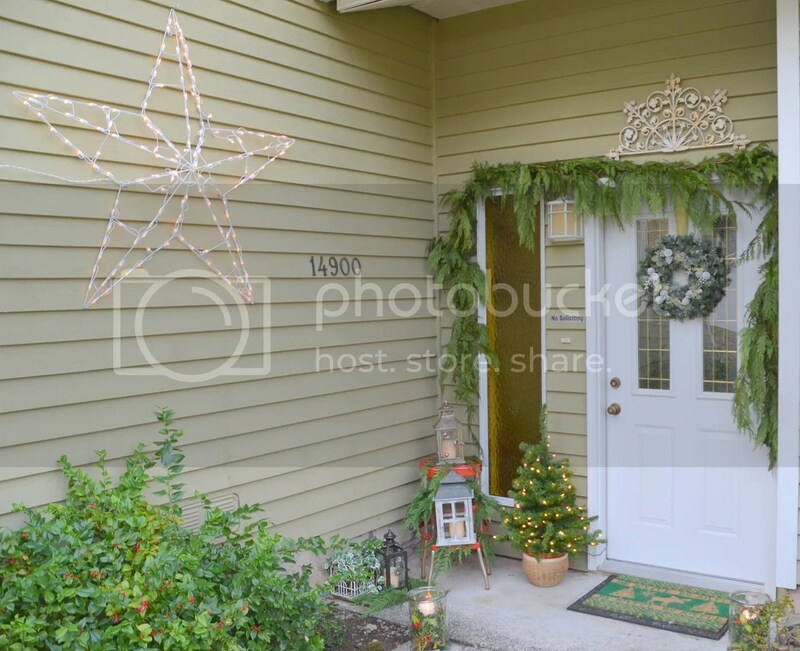 I don’t have a fine large porch and my Dear is not a hang the lights kind of guy. He does hang my lighted star and the lights on the tree. We don’t have our tree yet this year. I like the old china secretary passed down to us from Dear’s parents all lit up at Christmas. Decorating is not done this year yet. 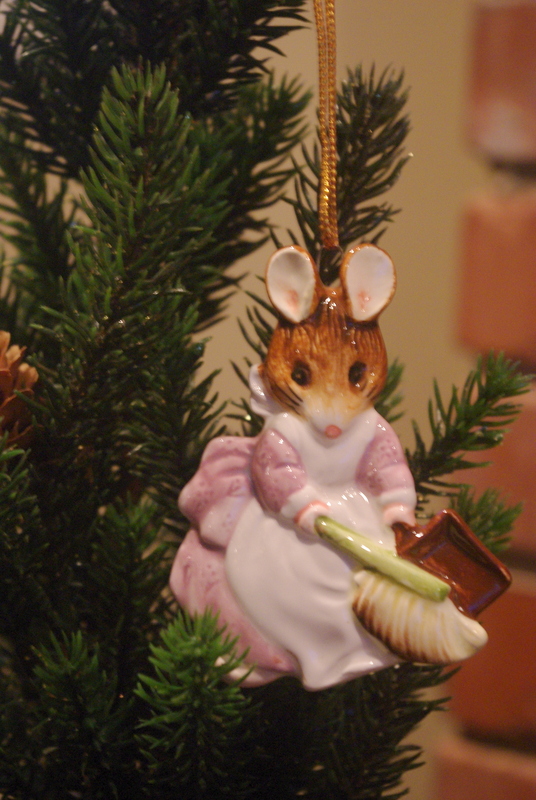 The photos I’m sharing are from Christmas Past. 2. 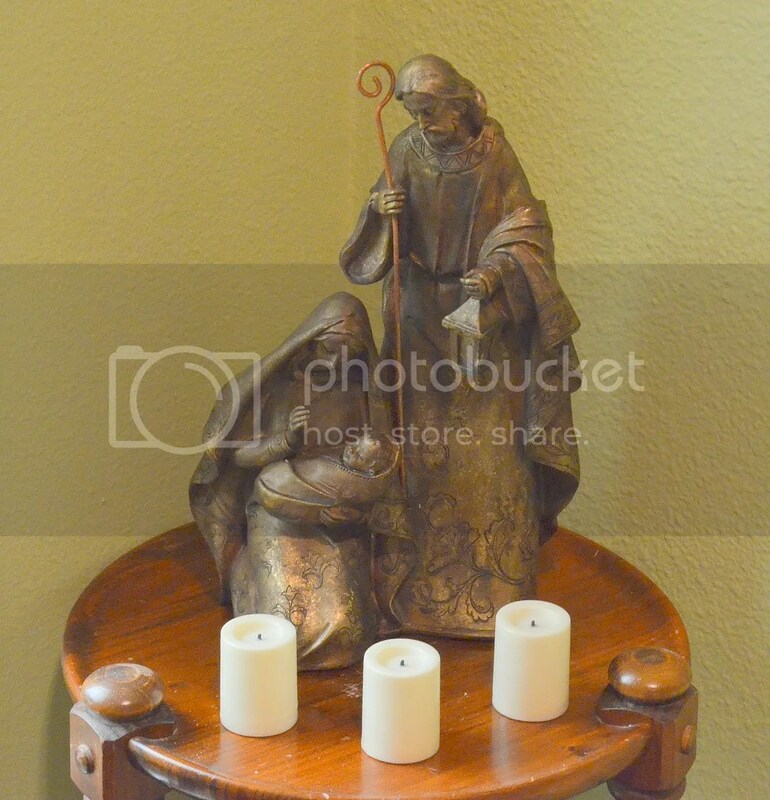 Is there a nativity scene in your decorating somewhere? Post a picture or, if it’s special to you in some way, tell us why. Or do both-it’s Christmas! 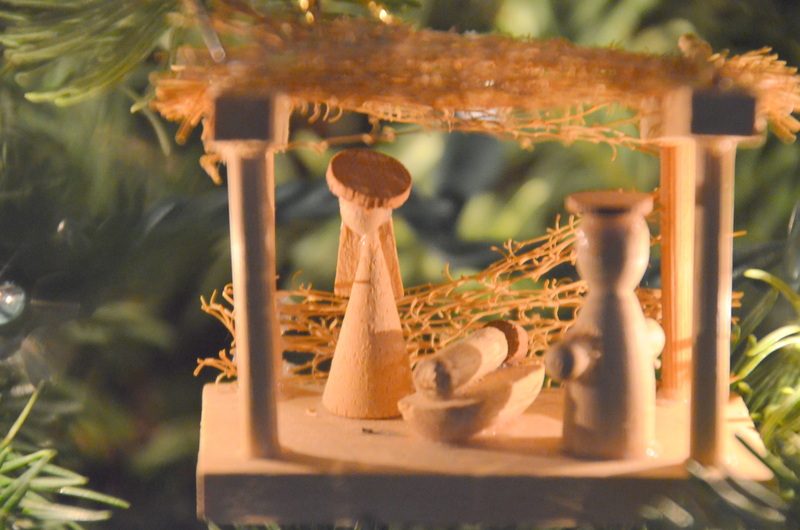 This little wooden nativity is the very first one we bought from Disneyland when our boys were young and before we had our little girl. I wanted something that they could handle and that would not be broken easily. 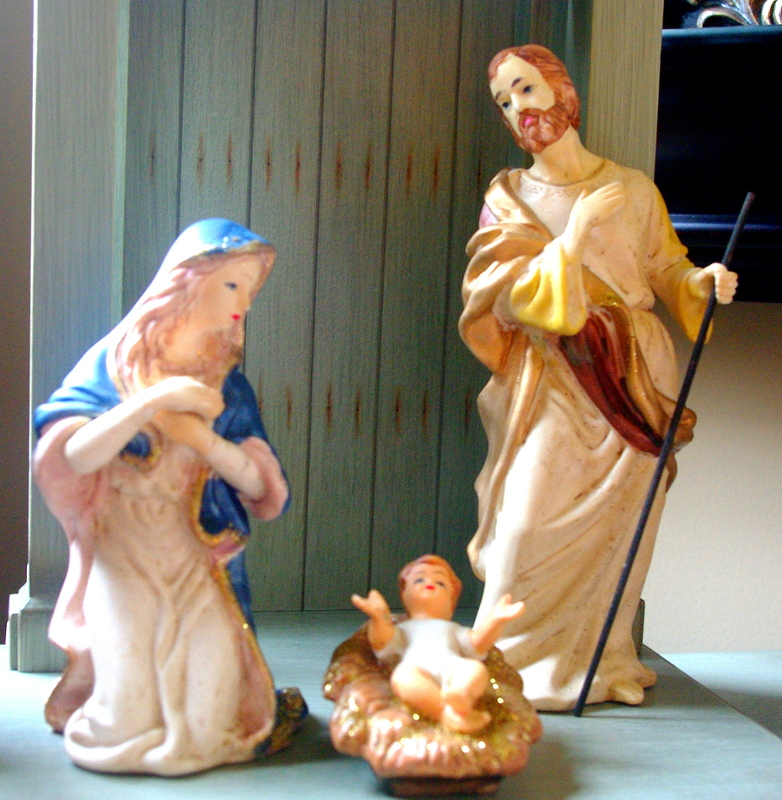 Lately I’ve collected a few nativities and enjoy putting them here and there and everywhere. Here are some of them. 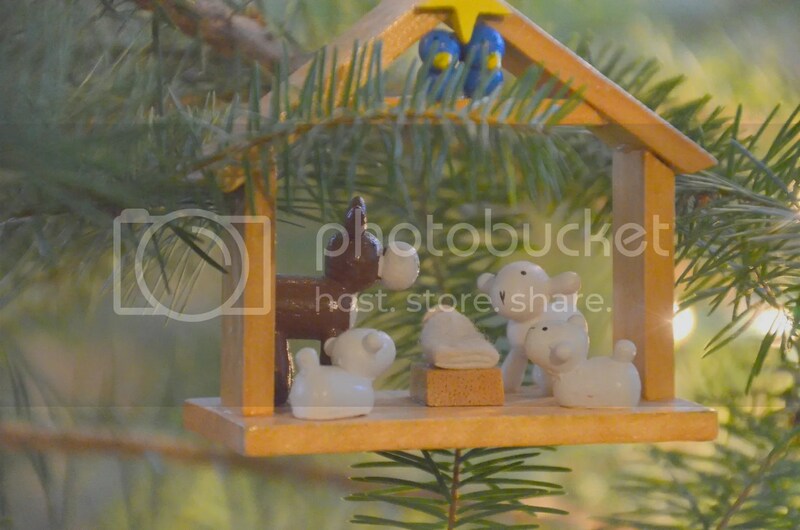 This last one is a Wee Forest Folk nativity. These pieces were given me individually over the last several years and the set is now complete. Our neighborhood is not social. I’ve been tempted to have an open house but have never followed through. In the past in other neighborhoods we would have 4th of July block parties or Christmas open houses. 4. As the saying goes, ‘there’s no time like the present‘. How does that ring true in your life right now? I don’t dread Mondays anymore. When I was younger I dreaded them because it meant back to school. When I worked it meant back to work. Now I’m okay with Mondays. My mother had a bad relationship with Mondays and I’ve had to get over that influence. I’m not a Christmas plant person and generally house plants end up dead. None on display right now. I do like live wreaths and garland. This is the 75th Anniversary of the attack on Pearl Harbor. This was 10 years before I was born and before my parents immigrated to the United States. When Dear and I were choosing our wedding date we decided on December 6th instead of the 7th because we didn’t want our wedding to be on the anniversary of Pearl Harbor. Today Dear and I are heading to La Conner to enjoy an anniversary meal a day late. Dear is getting over being sick and we decided to wait a day so his taste buds would be more ready to enjoy food. Hope you all are in the midst of the Wonder of it all this Christmas season. Linking to Hodgepodge Wednesday with Joyce at From This Side of the Pond. Thank you Joyce! Is it Hodgepodge Wednesday or Wednesday Hodgepodge?? Christmas is a time of wonder and joy. This old house has been decked for this most wonderful time of year. 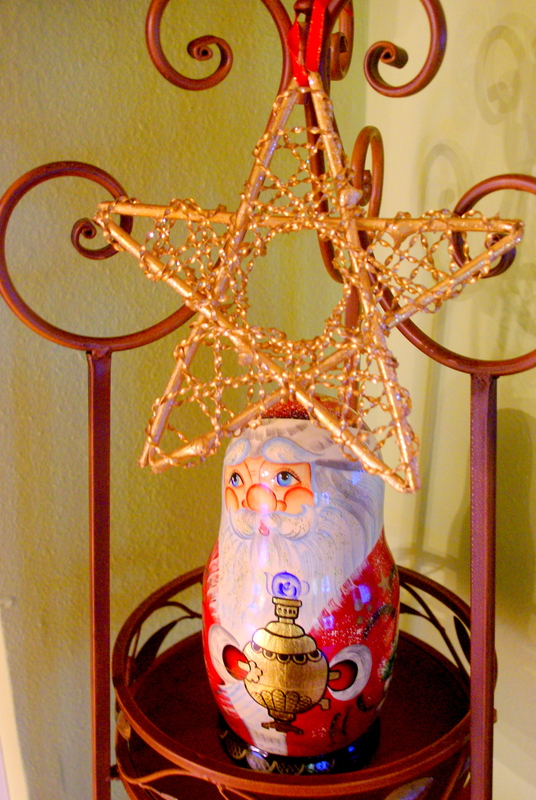 Our Christmas goodies are a combination of old and new. These mugs are from the late 80’s. The kissing Santa and Mrs. Santa are from my MIL’s stash and are probably from the 50’s, made in Japan. 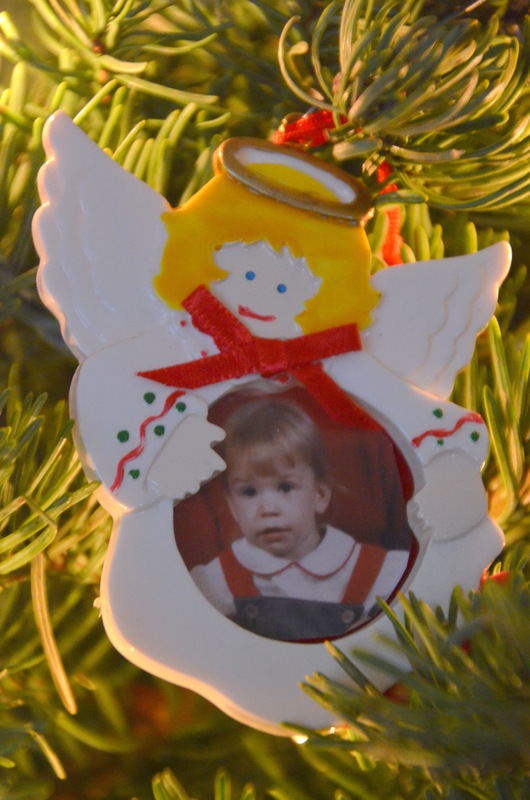 The Christmas angels and little girl bell are more old Christmas treasures from Dear’s mother. Our humble entry, inside and out. The living room with our fireplace. We are still talking about adding a mantle in the future. 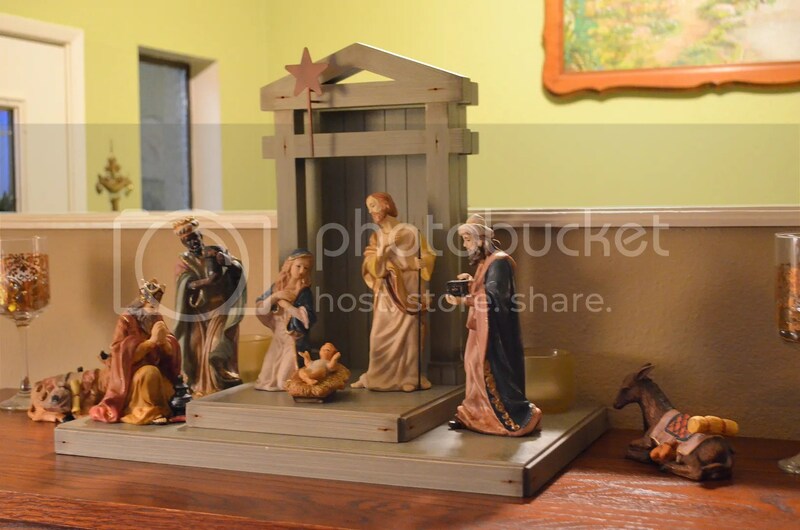 This wooden nativity was purchased at Disneyland and is a set that I bought that could be handled and enjoyed by our kids when they were toddlers. This rocker rocked all three of our children when they were babes. 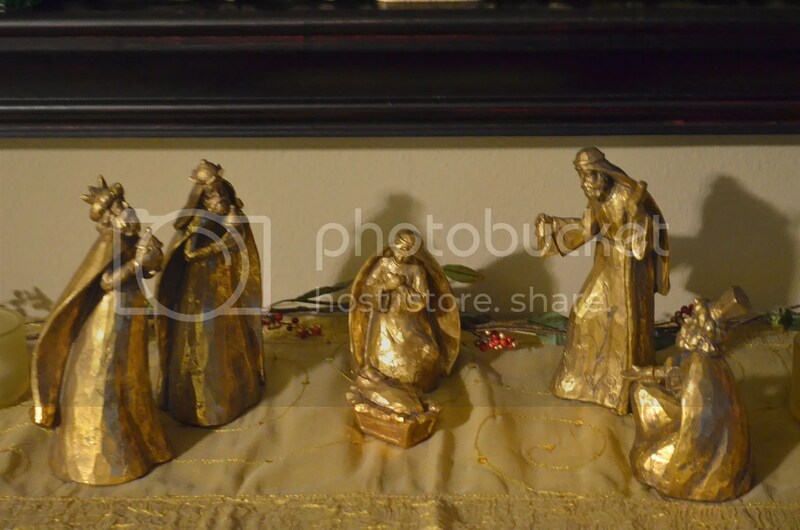 The nativity is a more recent acquisition but the angel trio are from my MIL’s Christmas collection. We have a new daughter in law this year so I decided to buy new stockings for our family of eight. Waiting for some wonderful times of sipping away with friends and family. 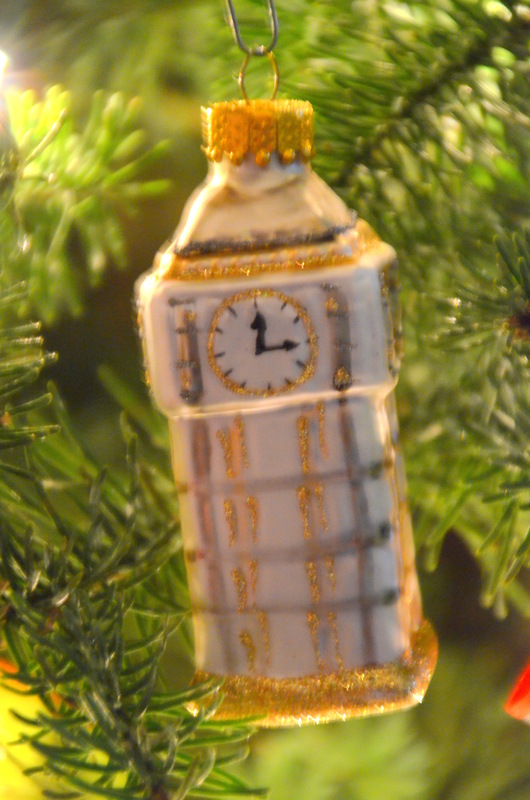 Hoping for a most wonderful Christmas for all my friends in bloggy world. Next post will reveal our sparsely decorated Charlie Brown Free Range Christmas tree. I’m linking up to ABC Wednesday for W is for Wonder, Wonderful, Wooden, Waiting, and World. 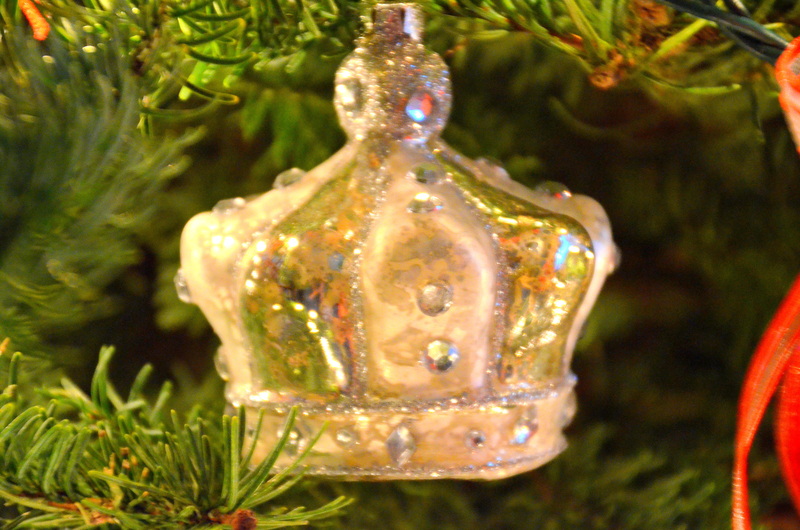 A Crown for my King. 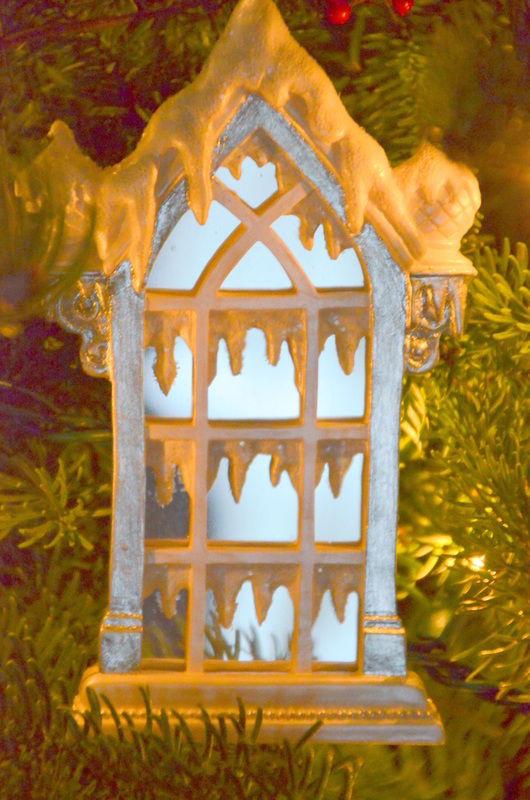 Frosted Window Panes from Russia. 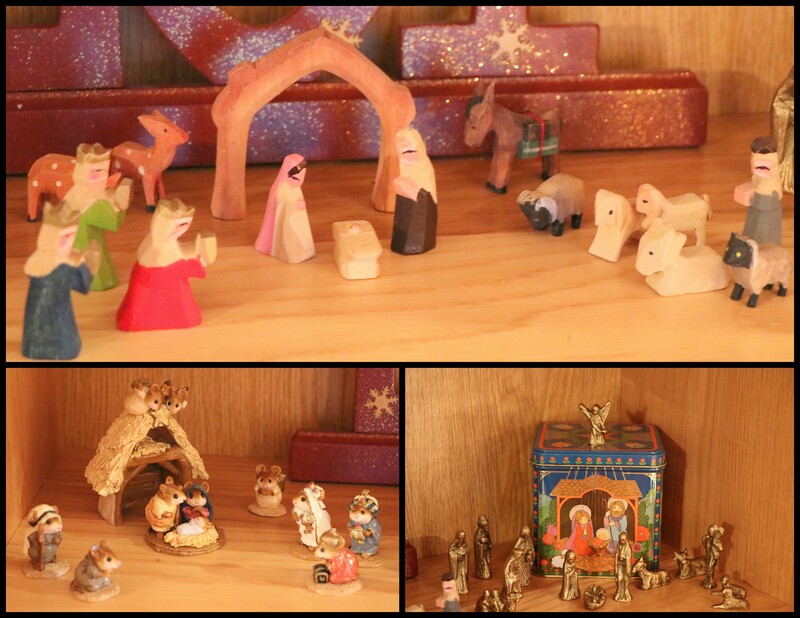 Our First Nativity, small and wooden. This one has been well used and some parts have been glued together. One of the animals is missing a leg. Ded Moroz Father Frost from Russia. 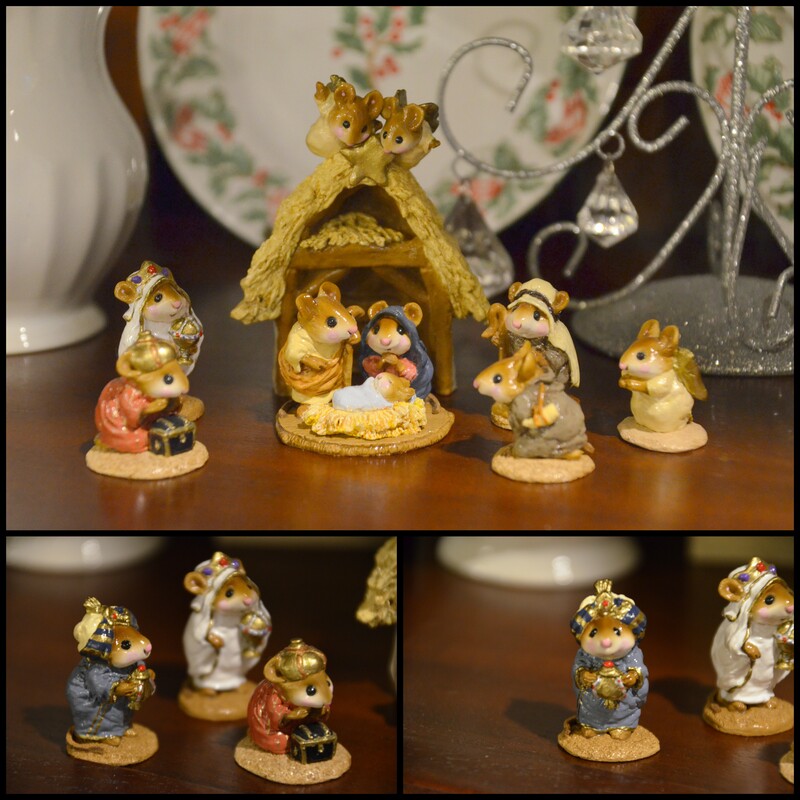 Just a few of our Christmas things up close and personal. I’ll be sharing a few more in the near future. 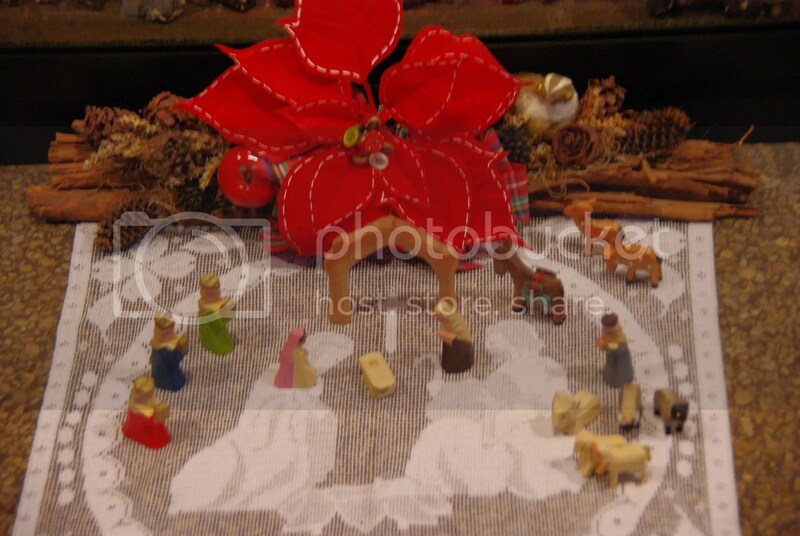 I shared a story earlier in December about our church Toy Shop Project for needy families in our community. Our church was able to help 315 families with grocery gift cards and toys for their children. We had over 2000 new toys that we gave away. Our goal was 1800. What a wonderful experience to be able to share in this way in our own community. I’m so thankful for a quiet week leading up to Christmas. How are your days?